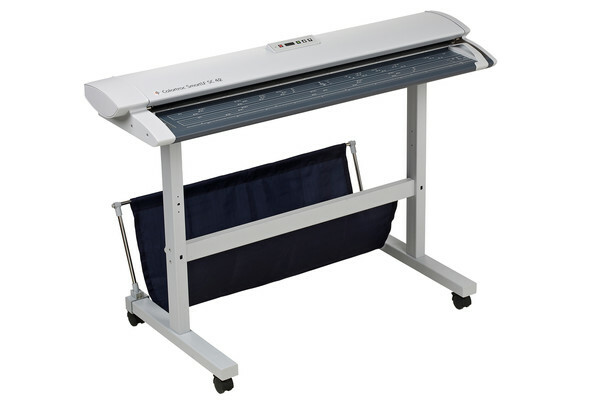 The 36″ Graphtec CSX300 can scan monochrome documents at a maximum speed of 7″/sec. and full-color documents at 2″/sec. @ 400 DPI. This scanner requires no warm-up time. This advanced technology also eliminates optical distortion and the need for frequent calibration. Interpolated resolution can be selected from 50 dpi through 9600 dpi in 1-dpi increments to suit the complexity of the drawing and the scanning application. Contex XD and SD Series wide format scanners deliver clean, sharp image quality for technical documents, sketches and maps, providing an easy and affordable way to save time on in-house scanning. Available in 24” and 36” the XD & SD scanners make it quick and easy to scan any technical document for printing, sharing, editing and archiving. Easy to use and surprisingly affordable, this high-quality scanner fits perfectly with your office workflows. 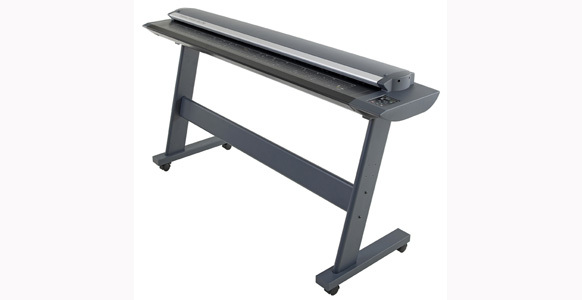 The SmartLF SC24 is a fast, accurate and affordable 24″ technical document scanner offering easy, face-up, instant-on desktop scanning and copying to any workstation or printer across a network. 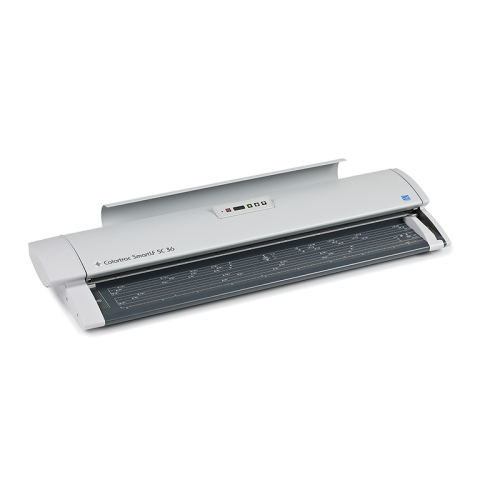 Fitting easily onto a desktop or wall shelf, the super small SmartLF SC25 large format scanner offers professional D-size scans and print productivity at the touch of a button. This scanner also comes with SmartWorks EZ scanning software. The ColorTrac SC series also allows the flexibility of coming in either a monochrome, entry level color, or high speed color models. The amazing thing about this scanner is that the monochrome model is upgradeable to color at any time. 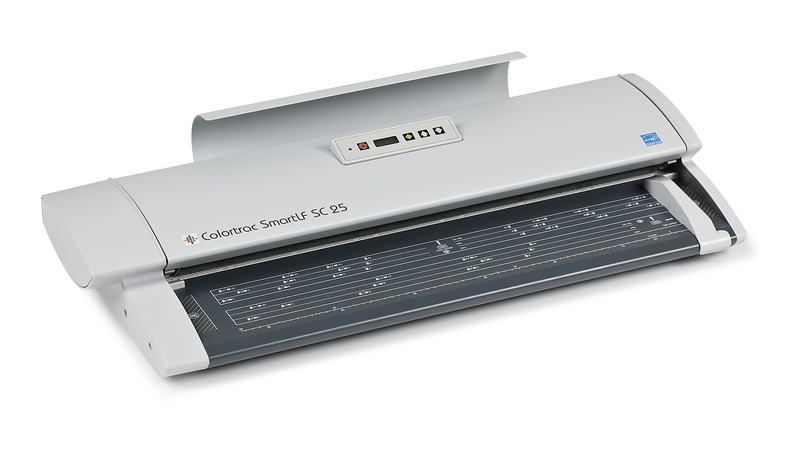 SmartLF SC36 is the fifth generation Colortrac CIS wide format scanner designed from the outset to be the most affordable, cost effective and portable 40″ technical document scanner on the market. The innovative design with its front exit media path, small footprint and light weight make desktop or wall mounted operation a practical reality. 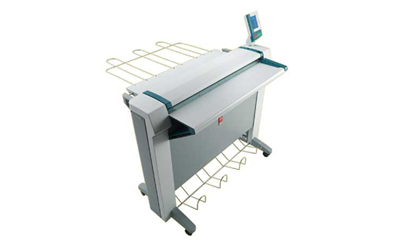 Fast and accurate, this large-format scanner offers easy, instant-on scanning and copying to your network. This scanner also comes with SmartWorks EZ scanning software. 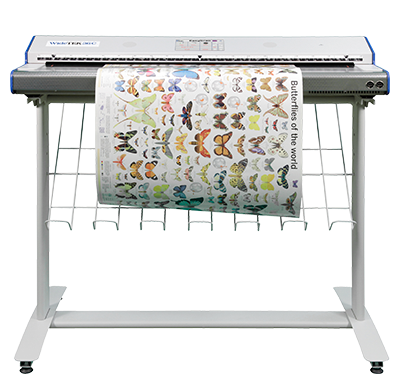 The ColorTrac SC series also allows the flexibility of coming in either a monochrome, entry level color, or high speed color models. The amazing thing about this scanner is that the monochrome model is upgradeable to color at any time. 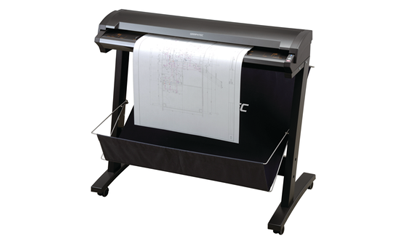 The new Océ TC4 wide format scanner takes the wait out of high-quality, maximum-information-retention scans. No warm up time and combined with speeds up to 16.4 linear feet per minute put you on the productivity fast track. The Océ TC4 color scanner easily expands the capability of your Océ printer, and with the Océ Multi-Printer Connectivity Kit, a single TC4 scanner can drive up to 3 printers, offering concurrent scanning, copying and printing. Streamline your workflow and improve productivity by bringing large-format color scanning in-house to complement your current large-format printing capability. Manufactured by Contex for HP, the HP DesignJet 4500 allows you to use the included software and touchscreen operating panel to integrate the scanner into your existing production environment, and turn any HP DesignJet printer into a streamlined multifunction system.. The GX 42-series features a line of 42″ large format scanners that capture a wide dynamic range of b&w photos and CAD drawings at speeds up to 12 ips for the M model, wide color gamut scanning to the 42m with color scan speeds up to 2 ips for the C model, and enhanced wide color gamut and faster color scanning at speeds up to 4 ips for the E model. T models allows for thick original scanning. 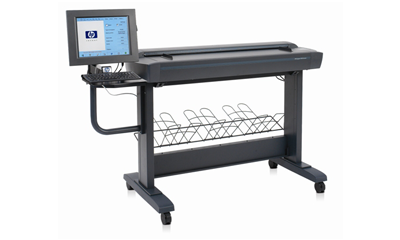 The NEW SmartLF SC 42 large format scanners feature new and innovative technology offering higher quality imaging, higher scanning speed and SuperSpeed data transfer. Model M features up to 13ips scanning in enhanced grayscale. Model C features color scanning capabilities with speeds up to 3ips in color and 13ips in monochrome. Model E features enhanced color scanning speeds of up to 6ips in color and 13ips in monochrome. 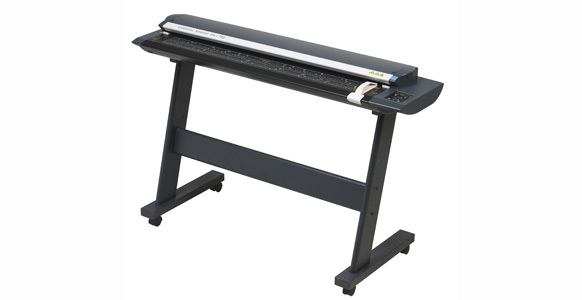 The GX+ 56-series features a line of 56″ scanners offers in different models. 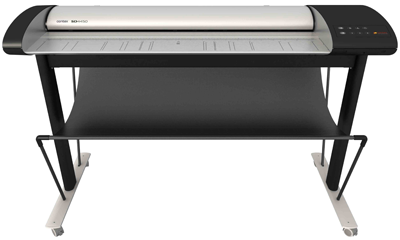 The M model is a hi-speed wide format monochrome scanner with enhanced grayscale scanning capabilities with speeds up to 9 ips. The C model adds wide color gamut and faster color scanning at speeds up to 1.5 ips. The E model adds enhanced wide color gamut and faster color scanning at speeds up to 3 ips. The T-series allows for thick original scanning. The WT36C scans at 10″ per second in color at 300dpi, which is three times faster than any other CIS scanner. It even outperforms the most expensive CCD scanners by a factor of two. This scanner also utilizes the Scan2Net technology that eliminates the need to install scanning software or Twain drivers to drive the scanner. 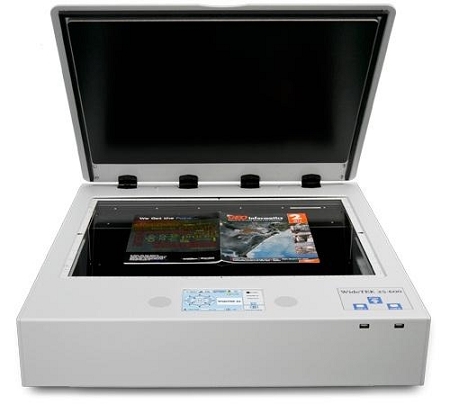 The WT36C, which has it’s own Linux PC operating system and 1200 DPI capabilities, has an internal memory of 6 GB, greatly increasing the processing speed of this scanner over its peers. The ImageAccess WideTEK® 25-600, the world´s fastest large format color flatbed, covers applications in every market, whether it is in the medical, government, industrial or graphics arts sector. It scans the full bed, 18.5″ x 25″) at 300dpi color in less than three seconds, which is two times faster than the closest competition. Perfect for artwork or delicate original scanning, this scanner also has an optional backlit attachment that allows for x-ray or negative scanning. Need to scan a bound book that you can’t take apart? The efficient Bookeye® 4 digitizes source material such as bound documents at high speeds in up to 600 dpi optical resolution. The clever mirror mechanism captures the document precisely from edge to edge, whether it is a flat document or a book open at an angle of 120 degrees. The V-shaped book cradle was optimized to reduce the risk of damage to book spines and binding during digitization. The book cradle holds the open book at an angle of 120 degrees; enough to effectively scan the contents of a page, while gently preserving the original subject matter. 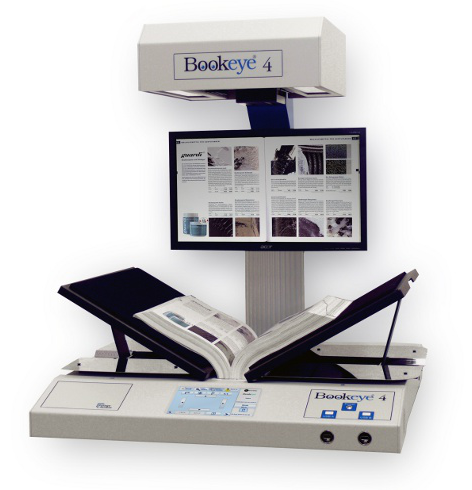 The Bookeye 4 comes is several different models, offering size options to handle any book you need to scan.